Great area rug. It looks exactly like the picture. It feels a little like "office-grade" carpet, i.e., it's not plush, but it wears like iron. A pad would help. I'm happy with it the way it is. It seems more expensive than it is. My cat thinks it's her personal scratching pad, but she has been unable to damage it from scratching. I wish I could get it in a larger size (9 X 12). It's very heavy. Spills do not penetrate the wool and are easy to clean up. The typical shedding from wool stopped after a few vacuumings. This contemporary-chic collection is sleek, sophisticated and simply sensational to the touch. Featuring a marvelously minimalist design in artfully understated hues, the Waverly Grand Suite rug is designed to add an air of easy elegance to any environment. 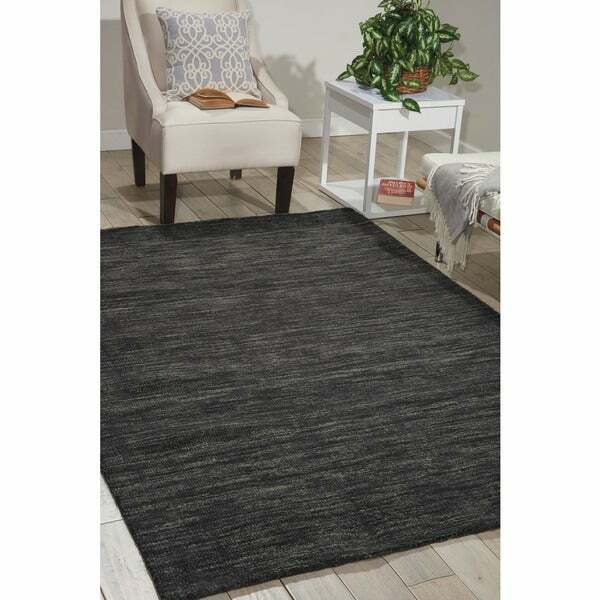 Waverly Grand Suite Nourison Charcoal Wool 8' X 10'6" Rug. This is a beautiful carpet. It is a loop pile, hand woven rug. Various shades of black, white and areas of gray blended together in a random pattern, gives the appearance of waves through out the rug. The shading hides any little white specks of lint or dust that would show up on a mostly black rug. Enlarge the online picture, it is accurate. The rug is very heavy, lots of wool, tightly woven, well crafted.. Because of the looped pile, your feet will not sink into it but it is a soft wool and pleasant to walk on. I purchased this in December, had a thin non-slip rug pad under it on a hard wood floor. After 2 months, I purchased a supreme felt thick pad and placed under the rug and it made a huge difference in comfort level. The rug is in my bedroom, so I wanted a little more softness and bounce. The loop is like a Berber carpet and appears like it would hold up well in a high traffic area. It doesn't need a thicker pad but I would recommend it. It does shed. Not too much, not as much as other wool rugs I have had in the past, but it will fill up your vacuum each time. I have seem little puff balls of wool floating around my home. I have a sensitive nose - and there were NO odors and/or smells. It took fours days from order to delivery to my front porch. I shopped the internet for price, no other site even came close. I ordered 2 of the smaller rugs in the same style and color last month to place in other parts of the bedroom. Very pleased with this purchase. GO Overstock! returned a safavieh rug due to the smell, this rug arrived and had no smell other than, well, smelling like a rug should. very comfy and texture / color is true to the photos. It's perfect. Right color and plush. I think I got a pretty good deal out of this. Quality is great. Just the right amount of plush. The color is very nice. I'd say the photos are very accurate. The rug is gorgeous ...black with some tan. Wool so it's soft but also sheds a bit, no problem with vacuuming a bit. My grandson slept on it the first night we put it in and he seemed rested! No complaints. This rug sheds and pills constantly. Also if you're looking for a true charcoal this appears to be more blue. I enjoy shopping on Overstock but stay away from this one. This is a nice low pile wool carpet. The pattern is striated in shades of gray with some cream here and there. It sheds, but that is to be expected with wool. My only complaint, the reason I'm giving it 3 stars, is that there are hard little knobs scattered throughout the pile when you step on it in bare feet. They seem to be bits of something like hardened glue stuck in the wool. I've been pulling them out as I find them. Other than this, it's a good rug.